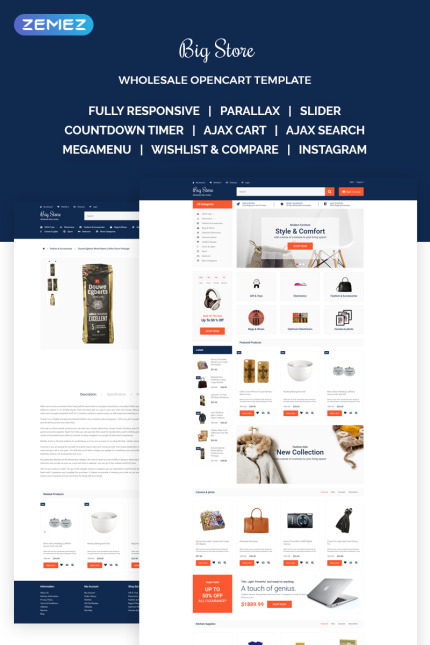 You can sell, literally, everything from the website, built on this wholesale OpenCart template! Fashion stuff, electronics, toys, furniture - it will fir both solo businessman and a group of merchants united under one "roof". The stylish color scheme focuses user's attention on important buttons and offers. The design is elegant and will look perfect on any type of the screen, either a smartphone or PC. Template functionality allows categorizing all the products in an understandable manner to make navigation smoother for the customer. If you have an Instagram account of your business you will be able to add its gorgeous gallery to the website, thanks to a set of included extensions.